For the past year I've been quite fond of candles and you could say that I slowly started collecting them and candle holders. I will show you my favorites today but I do own more candles than you'll see here. They are all over my apartment. Me and my mom both love them so we do actually use them a lot, but I use them mostly in my room during any time of the day. 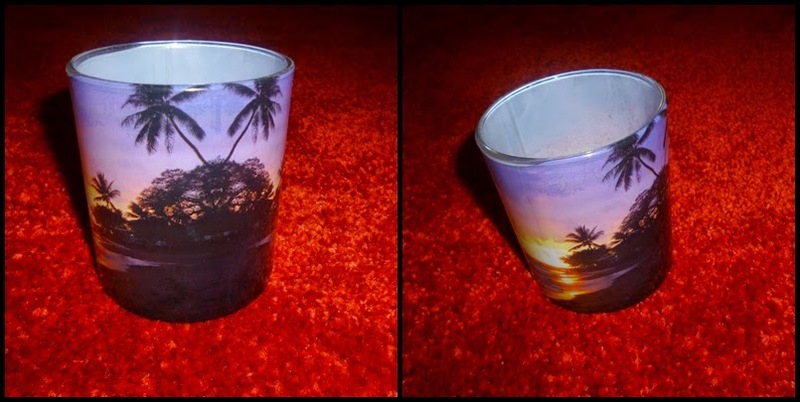 This is the oldest one in my collection (that's why the glass is so blurry). 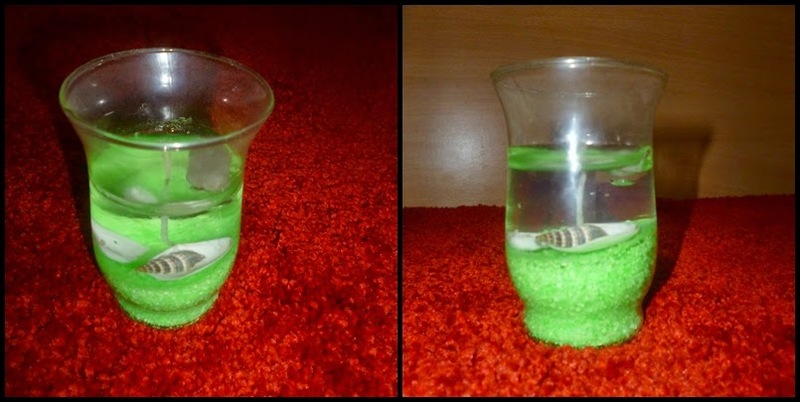 It's a creative candle with small green salt/sugar/stones in the bottom. Then come the shells and gel like wax. The stone on the top is my addition (I have no idea why I put that there. I've never actually lit it because I don't want to waste this beautiful candle (crazy, I know) but I can tell you it does not have any smell (not good one, not bad one). This candle holder is about two years old. It originally had a big candle in it that smelled really nice (blueberry, I think). When the candle in it is burning, this cover looks like a real sunset which makes the most beautiful atmosphere in my room. As I burned the entire original candle, I put tea lights and I get the same effect each time so there's no way I'm throwing this one away. I got this one for my birthday. This is a candle of beautiful dark purple color. It smells great. What's so fun about it are these 2 trees that represent Christmas (since my birthday is a bit after winter holidays). 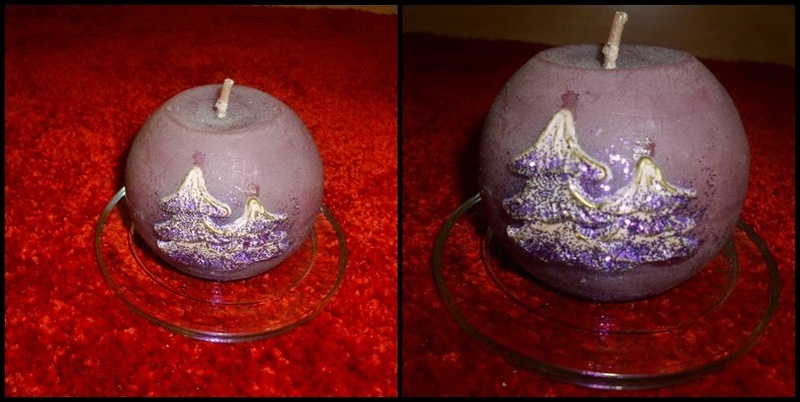 Also trees and half of the candle are covered with purple glitter. I've also never lit this just because I like to remember the person who gave it to me and I don't think I'll find a candle like this every day. This candle has such a beautiful shape. It's a bit round at the bottom which makes it a bit different from the others. I love it for it. The candle inside is original. 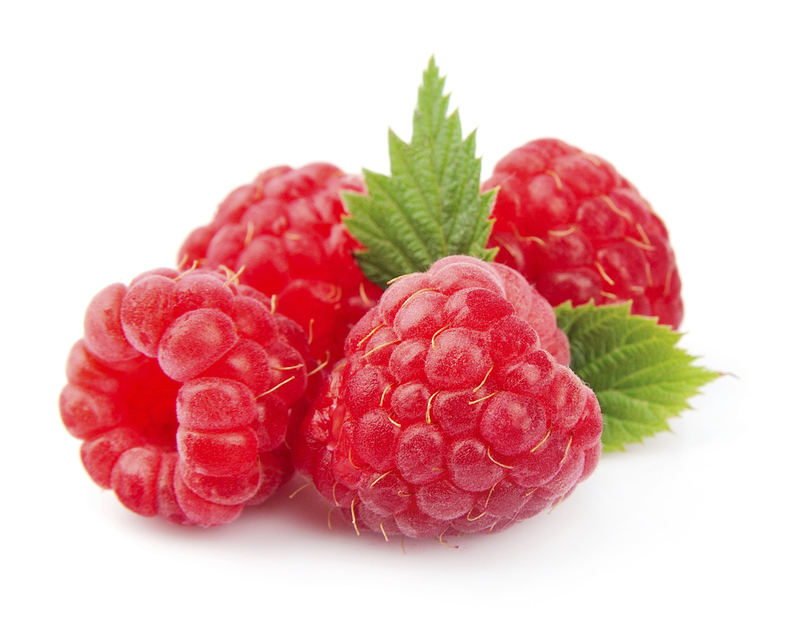 The color is baby pink and it has a raspberry scent if I'm not mistaking. Cover is harmonized with the wax color so we see all the pink shades - from dark pink at the top, to the really light pink, almost white color, at the bottom. This is one of my top 3 candles. This one I got for Christmas. I like to see it as a angel which is just about to go to sleep (she's wearing sleeping gown). I love this one because the friend that got me this one told me that it reminded her of me. I guess we do kinda look alike. 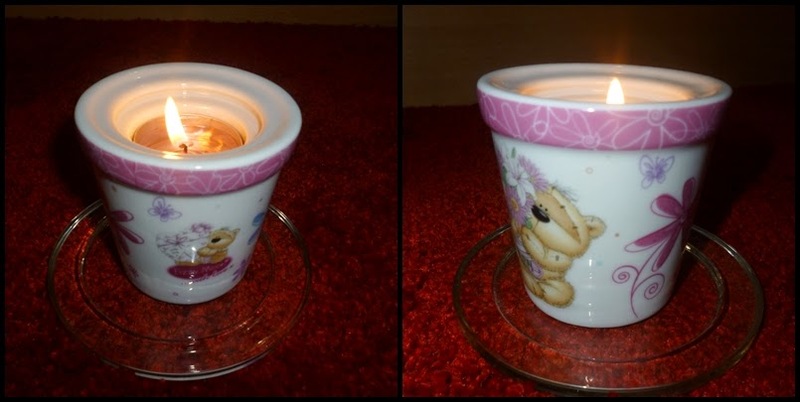 It is also suitable for tea candles which you can see on the left picture. But it can also be a great holder for your favorite earrings or rings. I love to look at it on my desk. Last one is the newest in my collection. I got it for my birthday two months ago. 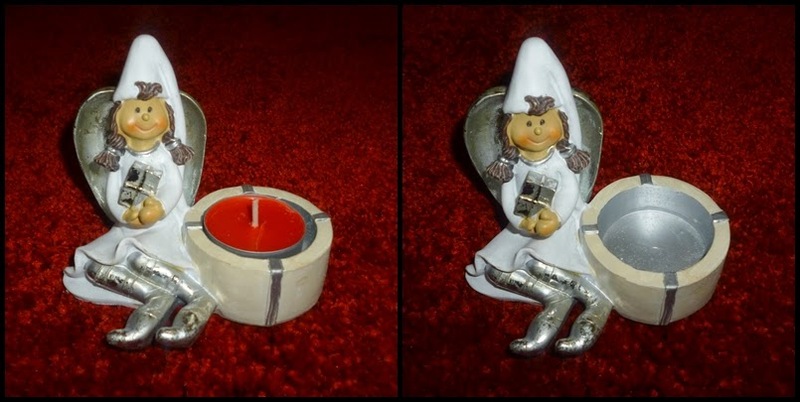 It has a saying on the back: "Someone special: Those who light up the world will not be left alone in the shadow". I really really love this saying. Also it has teddy bears and flowers and it's pinkish so I simply adore this candle holder. 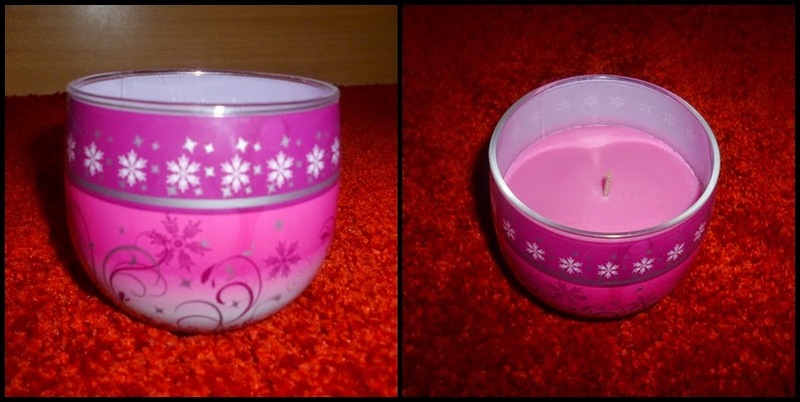 The original candle inside (you can see it in the picture burning) was baby pink without any scent. So, this is my candle collection that is actually situated in my room. If you're wondering, this glass plates were bought in IKEA for about $0,50 each (IKEA's catalog - decorations - candles and candle holders - JOKER candle plate. This red tea candle is my favorite candle ever. It has the most beautiful candle scent ever. It is strawberry but it's so strong and long lasting for about $2,50 (IKEA's catalog - decorations - candle and candle holders - SINNLIG tea candles).